Poyntzpass, Newry, Co. Down, N.I. 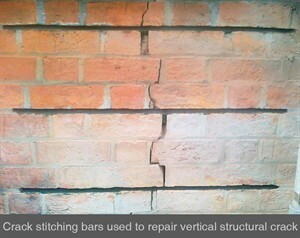 Where cracks in masonry buildings have been identified as significant, we at Stronghold Preservation have a range of systems to repair the structural integrity of the building; Crack Stitching Bars is one option. 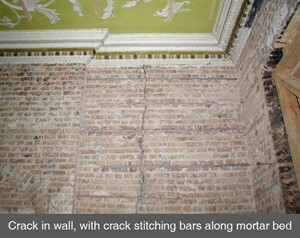 Crack stitching is generally used in buildings where the mortar beds are coursed (ie brick or block buildings) to reinstate the structural loading of masonry, which could have been caused by a myriad of events; settlement, thermal movement, additional loading, etc. However, each situation is different, and it is the expertise and knowledge of our surveyors that ultimately designs the best solution for each structural repair. It is imperative that a survey is carried out by our experienced surveyors, as this is a solution dependent on the cause, and is not suitable for all applications. Our experienced surveyors will firstly assess the building, and, if appropriate, design and specify a suitable crack stitching system. Our trained and accredited operatives place high tensile stainless steel helical bars within raked out mortar joints (at centres and distances determined by our technical staff) either side of the crack in the wall, along with specialised grout. The joints are then re-pointed. The crack stitching helical bars will increase the shear and tensile strength of cracked masonry walls, reinforcing the masonry, controlling the cracking, and distributing the forces back into the structure. Installable in all weather conditions. 13 Conyngham Street Moneymore, Magherafelt, BT45 7PX.